The title of this hand-drawn open edition card is “Above the Christmas Tree”. 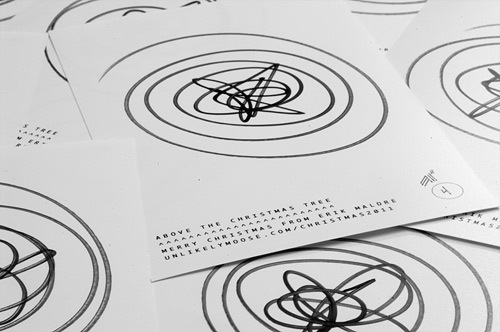 Initially this card was intended to represent the view of a Christmas tree from above. The center point is a treetopper star and the circle forms are the tree. My four-year old daughter simply said it was a star. Now there’s some symbolism. Here we have the Star of Bethlehem risen in the sky above all pointing to the Incarnation of our Lord Jesus Christ. A behind-the-scenes video is available at YouTube. It includes special guest appearances by a zebra, Optimus Prime, and much more. There is also a video of prep work leading to the production of the card. There is a shocking ending.